A year ago when KNSJ radio launched, the station promised to air our live wildfire and emergency alerts. Saturday is their anniversary party - please send a message TODAY asking them to honor this promise! In the July 2013 Chariot Fire the station did go live and I reported on the fire on Mt. Laguna. For a few weeks, KNSJ aired our alerts with a delay of an hour or so, promising to improve technology to get real live alerts. Later KNSJ stopped airing wildfire alerts at all. I’ve pleaded with KNSJ to air Viejas Wildfire Alerts as promised, which we offer them free, to save lives and keep you safe. In the backcountry when power lines burn and some have no cell service, battery-powered radio is often the only way to get news during fires. KNSJ’s CEO says having the federal emergency broadcast system in place is enough, but it’s not. It wasn’t activated during recent fires in East County. KNSJ's CEO and Board refuse to even guarantee a start date for alerts or an exact dollar figure that would guarantee these would air. They ask for more money, without delivering on promises made to donors who already gave to support getting alerts on the air. KNSJ also has zero live broadcasting, even for breaking news during fires. TAKE OUR POLL AND SEND A MESSAGE TO KNSJ: Should the FCC ask KNSJ to keep its promise and air live Viejas Wildfire & Emergency Alerts & have live news broadcasts during wildfires? During yesterday's Banner Fire in Julian, our reporter, Nadin Abbott, was at the scene. Several residents complained that they did not receive calls using the 911-directory to advise them of evacuations. Despite efforts by Sheriff officials some residents still said they had no warning at all. With radio they would have a way to listen and get updates, even if their phones or Internet or electricity for TV etc. is not working. Also, I feel compelled to dispel a false rumor that was deeply upsetting to me to hear today. This has NOTHING to do with funding for East County Magazine or Viejas Wildfire & Emergency Alerts. We receive the same level of very generous sponsorship from Viejas to keep you safe each year--whether or not our alerts air on radio or not. We thank and appreciate the Viejas Band of the Kumeyaay Indians for caring about keeping you, your family and neighbors safe and informed, and for their generous support that make our wildfire alerts possible. Now we ask that KNSJ show this same level of concern for people living in areas at risk for wildfires. We have generously helped KNSJ with donations, organizing fundraising events and bringing in new members to support their public radio station. We believe these donations should have been used to resolve any remaining technical issues and assure that live alerts be aired. Other fledgling community radio stations have live broadcasts, and KNSJ surely can and should, too. That said, KNSJ's CEO now says more funds are needed ($1,000 to $2,000) with no specific explanation of the technical challenges. If anyone wishes to donate to KNSJ for this purpose or assist with their engineering or equipment needs - and get a written guarantee from KNSJ that this time, donations would guarantee the alerts begin airing immediately, please let me know at editor@eastcountymagazine.org and I will put you in touch with the station CEO. Readers, if you care about wildfire alerts live during emergencies, please vote at the link above and then post your commments section below--and ask your friends to vote, too! That said, KNSJ 's station is tied in to the emergency broadcast network (the one you hear those test signals for) but that only covers the most major emergencies. We alert on far more through our East County Wildfire & Emergency Alerts which you can sign up to receive via email and/or Twitter. That said, KNSJ does have the ability to interrupt programming and go live if there's a truly region-wide emergency. They've done so a handful of times during major firestorms briefly but without adequate funds, it's not the best means for getting your emergency information at this point. The station is better at reporting local news, playing local music, etc. for programs that can be pre-recorded. Maybe someday that will get better. They are trying to find a second signal location. They actually got permission for one on tribal land but then the tribe decided it wanted to use that land for something else. Look at all the comments. I am amazed. 1) A 300 watt FM station in Descanso is worthless to anyone not with in a 20 mile radius. ( On a good day. ) 2) If you live in the back country you better learn how to take care of yourselves. 3) If you want to know whats going on fire wise. Get a scanner. Load a scanner app in your smart phone. Get your Amateur Radio ( Ham ) license. In any emergency: There will be no information on readysandiego. ( It's ALWAYS been that way channel 8! ) The information on all local media WILL BE WRONG. The information on government websites and social media feeds WILL PROBABLY BE WRONG. Who is John Galt? After 3 years on the air or so the station can apply to the FCC to boost its signal for broader reach. But even now, on good days it can be heard all the way to the coast and as far east as Imperial Valley, much farther than 20 miles because the transmitter is on a 6,000 foot high peak. There is also an online feed for KNSJ that people could hear on a cell phone or anything with an internet connection - you could plug it into your car charger to hear it while you're evacuating, for instance. That scan, scanners are also very valuable tools for those who can afford them, and there are scanner aps that can be downloaded. But you still have to know to turn on the scanner, and an alert heard on radio (or received via our existing email and Twitter alerts) can give people a heads-up that an emergency is underway. 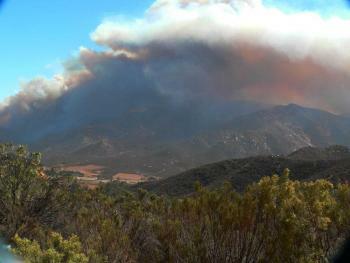 Having a family homestead in Julian, I know that news about wildfires is important! The current fire is below our Kentwood homestead in Whispering Pines area. I eagerly await any information that is shared on any media. A community radio is the best, because we have access to it, even if there is no electricity in area. We can use battery-powered radios to hear the latest! Our area has had major wildfires over the past two decades, especially during 2003 and 2007. It is heartless to say the least to withhold such important information on a COMMUNITY radio!! If I recall correctly, the Red Cross did something like this to us during a wildfire awhile ago. The Red Cross used money raised for wildfire victims for another purpose. I think the local head or board stepped down as a result. Thereafter, money raised for specific uses was used as promised in the fundraising appeals. KNSJ was billed as a community radio station gaining FCC approval for its broadcasts [under the auspices of Activist San Diego (ASD)] from Descanso for the local East County area. Now, that it won this approval, it seems that East County interests are far from its thinking. Accepting donations for a specific service and failing to perform that service is a breach of contract! So, KNSJ should return the donated funds to the donors immediately! Anyone who donates to an organization that fails to perform is failing to consider the previous actions of the organization! Failure should not be rewarded! Saying the Emergency Broadcast System is sufficient to serve the needs of the local area for things like fire and flood info is both ignorant and callous. You presented yourselves as community based and community minded. This refusal to help the community in such a basic way just makes no sense to me, either commercially (such great PR to basically give your local community the middle finger!) or in terms of your humanity and compassion. You have , at this point, totally alienated and lost two listeners (my wife and I) and you bet we will do what we can to spread the word about your reneging on your promises--and promises, no less, that, when fulfilled, have the potential actually to save life! These alerts - fire, winds, or other disasters - fall into the Public Service Announcement category of things radio, TV and other media are required to do - or do because they want to. Besides the FCC, I'm sure the County Board of Supervisors, especially Diane Jacob, would urge that KNSJ to do as East County Magazine, the U-T, and San Diego 2-1-1 already do. If you want fire alerts on the radio post your comments here. Are you a fire survivor? Fire Safe Council member? Firefighter or fire chief? Do you live in East County, the area KNSJ is supposed to serve per its FCC license? Or in San Diego and concerned about wildfires in your area too? (Our alerts cover wildfires countywide). If so please post your comments here and we will pass them along to KNSJ's leadership. Thanks.